Providing people with a joyful experience that a higher level of health and fitness can bring into their lives. I know first hand the challenges people face in achieving the life they desire. Exercise trends come and go. The media tells us how we should look and feel, as well as pointing out everything that is wrong with our health. On top all that, our body’s needs and fitness values continue to evolve as time goes on. Many people feel as though they’re trying to hit a moving target in the dark. It can be confusing and dis-heartening. We all know that it takes much more than a treadmill and some crunches to transform. I will help! I will provide you with all of the necessary resources and tools for you to make the desired changes to your body and health. I offer a number of options that will provide you with the program you are looking for. 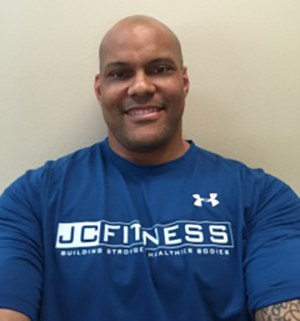 By staying true to my roots and passions, yet continuously striving to gain the knowledge necessary to improve, JC FITNESS is the environment for you to realize the fitness lifestyle that you’ve always dreamed of. I’m committed to helping you get into to best shape of your life, and stay there.